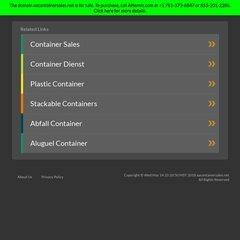 www.Aacontainersales.net - AA Container Sales, Inc. Topics: Modified Container Units, Specialty Container Units, and Container Unit Modifications. It is hosted by Theplanet.com Internet Services Inc (Texas, Houston,) using Apache/2 web server. ns64.domaincontrol.com, and ns63.domaincontrol.com are its DNS Nameservers. Aacontainersales.net's server IP number is 67.18.176.254. PING (67.18.176.254) 56(84) bytes of data.